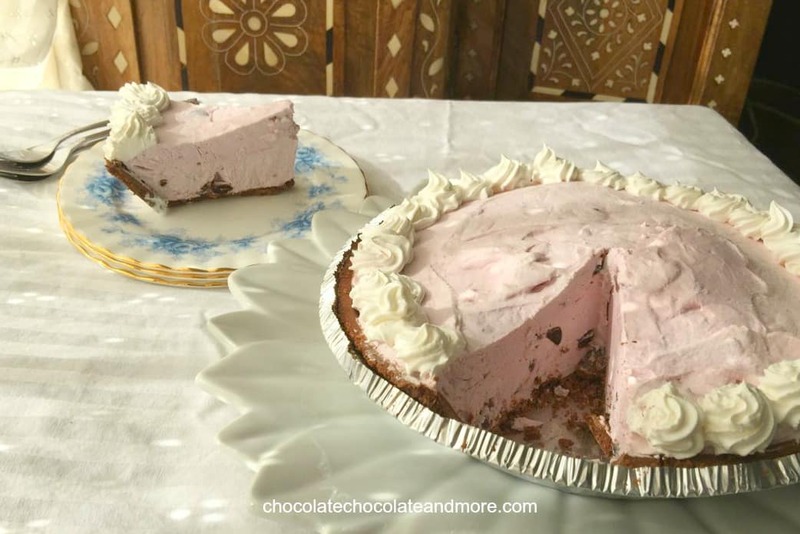 Black Forest Yogurt Pie - Chocolate Chocolate and More! 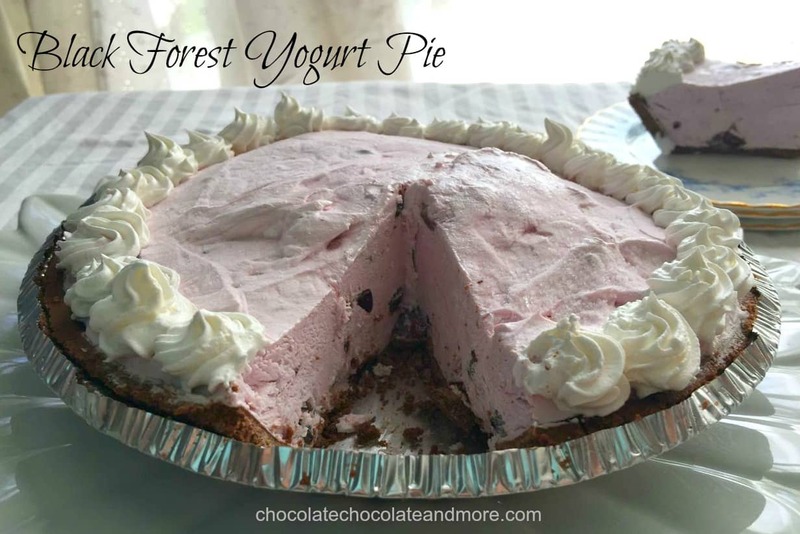 Black forest yogurt pie takes just 5 minutes to make and is a light, flavorful treat. Becky is away at college and I’m missing her. This weekend was parent’s weekend but I couldn’t afford the trip up there to see her so I’ll have to wait until Thanksgiving. In the meantime, I’m putting together a care package for her. She wants some salsa from Texas so I bought a jar of the local stuff. I also put in some wool socks as she’s already cold. I haven’t decided what else should go in the box yet. When I was in college one of my friends introduced me to yogurt pie. They’re so easy, cheap and versatile the we had them a lot – almost as much as we had pizza. What’s even better for a single college student, is they freeze well. I used to keep one in the freezer and slice off pieces to have while I was studying. I’d only thaw the whole thing if friends were coming over. For those of you from outside the US, Cool Whip is stabilized whipped cream. If you can’t buy Cool Whip where you are or you prefer a substitute with fewer chemicals, you can make your own by following this recipe. If you want to reduce calories, use plain yogurt and add fresh fruit instead of the flavored yogurt. I used fruit on the bottom black cherry Greek yogurt for my black forest yogurt pie. I like the consistency of Greek yogurt better than other types of yogurt. You can use regular yogurt if you prefer. And you can choose any flavor yogurt. Lemon is really nice as is strawberry. I also used a pre-made chocolate crust but you can make your own. Aside from the time savings, the great thing about the pre-made crusts is you can turn the top over to make a lid for the pie. 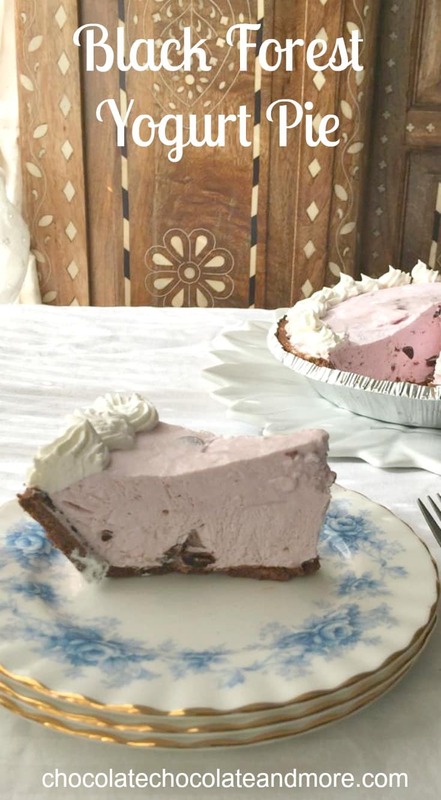 There is a recipe for chocolate cookie crust with this vegan chocolate silk pie. It’s easiest to slice this pie while it’s frozen but you’ll want to thaw it before serving so the chocolate chips aren’t too hard. It also has a very creamy texture when it’s thawed. Mix fruit into yogurt and then mix yogurt into 6 ounces of the Cool Whip (3/4 of the tub). Add chocolate chips and then fill the crust with it. Put last 2 ounces of Cool Whip in a pastry bag with a tip and use it to garnish the pie before serving. This looks very tasty, however (isn’t there always a “however”?) I have a severe dislike of Cool Whip. An edible oil product is not my idea of a treat, but then I was raised with whipping cream…the real dairy whipping cream. If fairly stiffly whipped, that would make for a good substitute for Cool Whip, wouldn’t it? Hi Paula, I’m not a huge cool whip fan myself as I started cutting out processed foods when I had kids. There is a link in the recipe to stabilized whipped cream which is a substitute for Cool Whip. The main thing is to add a little gelatin to fresh whipped cream so it holds up like Cool Whip (which has chemicals that make it stand up in the heat and over time). What a great idea! I love that you can change this up so easily to suit your tastes. I will definitely have to try this soon!